The Mystic Order of the African Illuminati has been quietly observing the recent actions of European luxury clothing brands that wish to maintain their air of exclusivity by alienating African Americans who, through the sheer power of their culture, have made these brands appear as fashionable extensions of hip-hop culture. We seriously doubt that Guccio Gucci ever wanted his brand to be synonymous with 21st century African American cultural aesthetics when he established The House of Gucci in Florence, Italy in 1921. This is ironic when you consider the fact that Florence, Italy became a haven for high fashion and design through the efforts of 16th century Moorish monarch and fashionista Alessandro de Medici (July 22, 1510 – January 6, 1537). 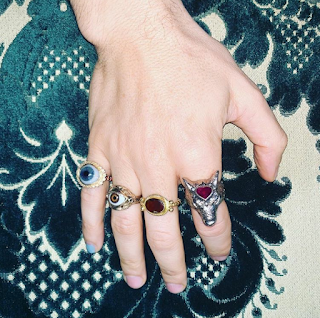 Gucci’s current creative director is Alessandro Michele whose hand is pictured below. We are fairly certain that the Gucci founder knew of the Moor who made Florence, Italy a hub for the arts in its many expressions. Whether or not his descendants, who’ve inherited his multi-billion dollar clothing empire do, is another story. The Order is not interested in exploring that story. However it would like to offer some useful insight concerning the media confusion surrounding Gucci’s Balaklava sweater which allows the wearer to walk around in Black Face. Balaklava is a commercial city that was once a part of the Byzantine Empire. The empire included Greece and modern day Turkey. Recently one of The Order’s emissaries traveled to Turkey and found that the Gucci brand was synonymous with Dapper Dan and the African American hip-hop cultural aesthetic. In Istanbul, there are beautiful looking and well-made knock-off versions of Gucci clothing. However these clothing designs in Istanbul, Turkey are filtered through a standard of fashion dictated by African Americans from the ghettos of North America. 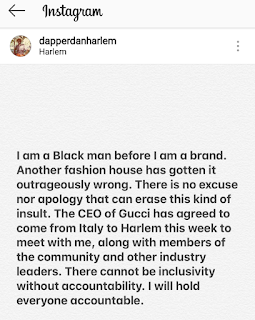 When our emissary traveled through ghettos in West Africa they also saw knock-off versions of Gucci slippers and shirts with Dapper Dan’s name emblazoned on them. The bootlegging is driving down the global value of Gucci clothes by making its monogram highly accessible to the have AND have-nots of the world. However, the Gucci brand, like other European luxury fashion brands, was not built on INCLUSIVITY. It’s a multi-billion dollar fashion empire built on EXCLUSIVITY, which is rooted in a Member’s Only ethos. The global bootlegging of Gucci is driven by African American pop culture’s LOVE for the Gucci brand which legitimizes it across the planet. The old European mind cannot be absorbed by Blackness and live. To maintain its existence it must seek exclusivity for the purpose of separation. The identity of whiteness dissolves when it internalizes Blackness so it needs separation. To salvage the elitist intent of the brand—which made it exclusive—Gucci owners intentionally made African American’s HATE the brand by introducing the Balaklava sweater to drive down its demand. The drop in demand will cause a sharp decline in the bootlegging that is cheapening the Gucci brand through the easy accessibility of its monogram. This monogram, which is basically a sigil, has accumulated a great deal of occult power and currency after 98 years in existence. That power is being siphoned off by the great grand sons and daughters of African slaves who have voluntarily sold Gucci to the world. African Americans are not to be mocked for their perceived acts of ignorance, whether they are rappers who promote Gucci headbands or name themselves after the brand. It is the preoccupation of the Mystic Order of the African Illuminati to give disenfranchised African Americans ideas and stimulate their imaginations, not make fun of them for making bad decisions. When people know better, they do better. Dapper Dan is an important figure in the history of hip-hop fashion. Based on the looks of things he gives a certain level of global credibility to the Gucci brand as well. Gucci creative director Alessandro Michele landed in hot water in 2017 for stealing one of Dan’s distinct designs, although Dan was known to incorporate Gucci monograms into his own fashion pieces throughout the 80s and 90s. 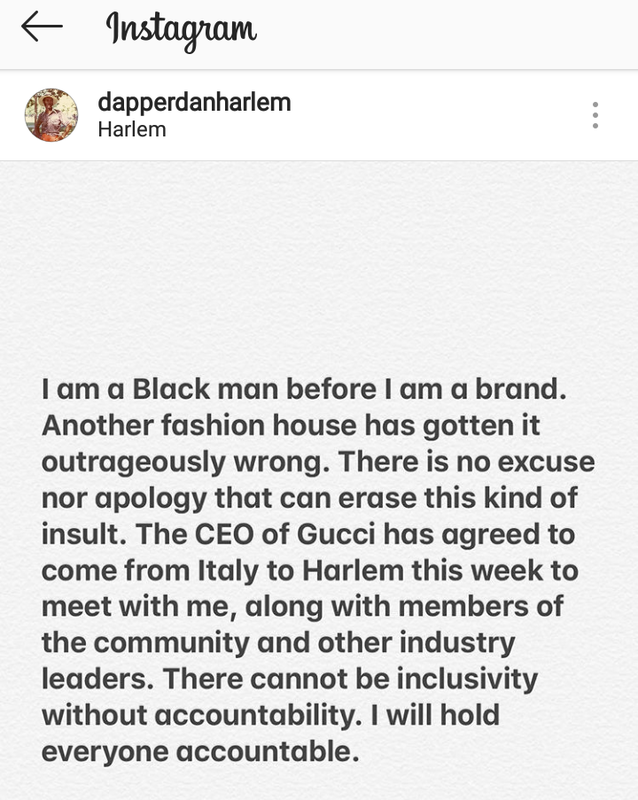 Dan, who has partnered with Gucci since the 2017 controversy, expresses his thoughts on the Gucci sweater issue in the Instagram post below. 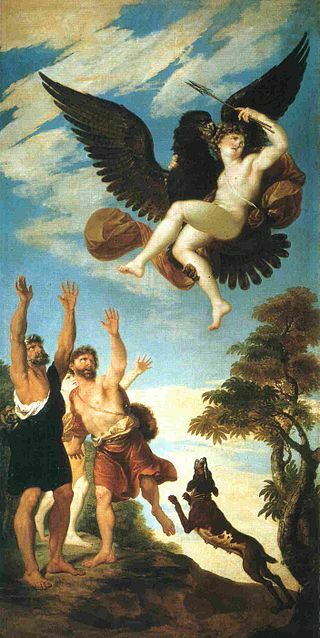 In Greek mythology Ganymede was a mortal Greek man who was abducted and screwed by the Olympian god Zeus, who was also known to the ancient Greeks as Ethiops. An Ethiop was also what the ancient Greeks called any dark-skinned person from Ethiopia which was a general name for the dark-skinned Africans they encountered, not necessarily modern day Ethiopia. Clearly Zeus has strong ties to Africa according to the ancient Greeks. 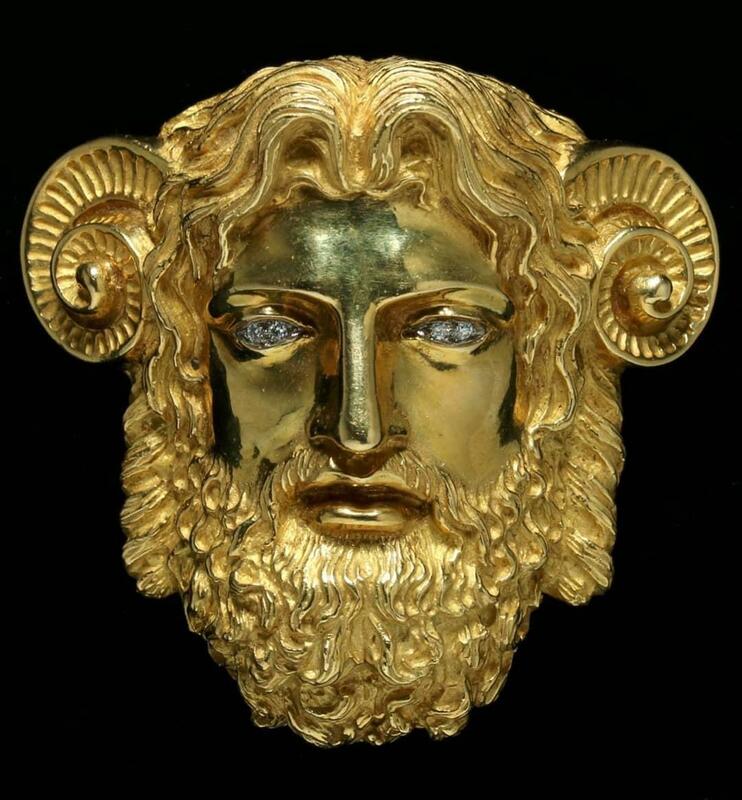 Greek culture is at the very foundation of all European civilization. It is one that professes that one of their own was abducted and penetrated by a Black god, just as African American pop culture is abducting and penetrating the imagination of Europe and the entire known world. You can make Ganymede clothing friendly to the white LGBT community through subtle suggestions in visual design. All modeling advertisements would exclusively feature skinny Nordic male and female models with blonde hair and blue eyes. Portions of the revenue from Ganymede clothing can be invested in S.T.E.A.M. (Science Technology Engineering Art and Mathematics) youth programs in the Black community. If you are able to execute this idea, then take it and run with it. The Order thinks that it is something to consider. If a group of people want exclusivity in their products and services, you don’t have to get upset. See if there is an angle for you to sell them what they want so that you can bankroll your own agenda. For African Americans who are looking for high end formal wear produced by Black designers, you may want to consider RamOmarNy. We also recommend you check out 21 other Black designers by clicking the link right HERE. Don’t focus on abstaining from European brands that don’t value your patronage. Focus on spending money with industrious Black creatives.